Really Rocket Science » Blog Archive » Shields On, Captain! The image above may look like science fiction, but today it’s actually science. The BBC reports that "British scientists are planning to see whether a Star Trek-style deflector shield could be built to protect astronauts from radiation." The cancer-causing radiation from cosmic rays and solar flares has always been a danger to astronauts, but that danger has been mitigated by the minimal durations of time that most individual astronauts have spent in space. But these protective shelters would not be practical on long-duration space journeys, since the "drip-drip" of energised particles is thought to be as harmful to the health of astronauts as large solar storms. The harmful particles come from the Sun, in the form of the solar wind, and from sources outside our Solar System. To create the deflector shield around a spacecraft or on the surface of a planet or moon, scientists need to generate a magnetic field and then fill it with ionised gas called plasma…. "You don’t need much of a magnetic field to hold off the solar wind. You could produce the shield 20-30 kilometres away from the spacecraft," explained Dr Ruth Bamford, from the Rutherford-Appleton Laboratory in Didcot, UK, one of the scientists on the team. Dr Mike Hapgood, from the Didcot-based research centre, told BBC News: "The nice thing is that magnet technology is really quite evolved here on Earth. The question is can you take it into space?’"
The idea has been likened to the deflector shields which protect the USS Enterprise and other spacecraft in Star Trek. Like their fictional counterparts, these shields could also be switched on and off…. The idea for the shields draws on technology pioneered in experimental nuclear fusion reactors. Nuclear fusion is not yet a mature technology. It works on the principle that energy can be released by forcing together atomic nuclei rather than by splitting them, as in the case of the fission reactions that drive existing nuclear power stations. 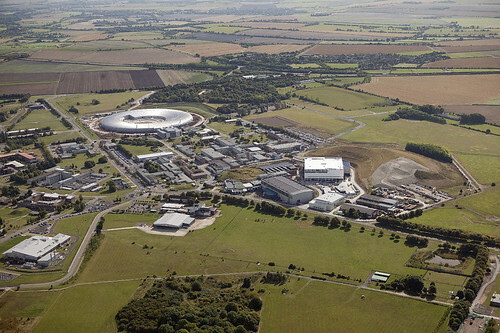 The Rutherford Appleton Laboratory (pictured below), where the research is taking place, "has a staff of around 1200 who support the work of over 10000 scientists and engineers." Located in Oxfordshire, RAL is one of the largest space research laboratories in Europe. The big engineering problems with this approach still have not been solved. (1) If you’re not using superconducting magnet coils, a large, static magnetic field requires a huge power supply to keep it going. That’s not practical for foreseeable, near-future technologies for going to Mars, which will need to use very small payloads. (2) Superconducting magnets are unreliable, finicky beasts, at least from my experience here on earth. You need big, heavy cryostats full of liquified gases. It’s not necessarily a good idea to have a vital piece of safety equipment for your spaceship depend on an inherently high-maintenance, low-reliability technology. (3) Large electric fields are hard to maintain because you get arcing and discharges. I used to work at an electrostatic accelerator that used megavolt potentials, and it would start sparking at the most inopportune times, for reasons like, e.g., someone leaving behind a speck of lint inside the accelerator. When a spark would happen, you could hear it all through the building, and the energy released was equivalent to dropping a VW bug off the roof of a building. Again, low-reliability, high maintenance. (4) Although it’s possible to use tricks to get rid of some of the particles, or channel particles to a place where they’re not as harmful, you still have to deal with the fact that you have particles with both signs of charge, which feel forces in opposite directions from the same field. What repels one attracts the other. Also, if the particles get channeled to a certain place, and impact on something solid, then you get extremely intense secondary radiation at that spot. Of course, this is pessimistic nonsense. We’ve seen magnetic fields work nearly 80 times. This entry was posted on Thursday, April 19th, 2007 at 7:15 am	and is filed under Front Page, Navigation/GPS. You can follow any responses to this entry through the RSS 2.0 feed. You can leave a response, or trackback from your own site.